So my ambers weren't the only new arrivals on Saturday. Friday saw the launch of the new X Necklace Collection and Wishes Can Come True, the new Ocean Blue Limited Edition (LE) X links and the first Bronze decorative link, My Heart. I'd been wrestling with my budget and ended up throwing it away to indulge in even more of the new carved amber beads, so I had to scale back on my original plans with the new X collection. No big statement necklaces yet for me... BOOO! The big statement necklaces that I can't indulge in just yet! So when I ordered online I decided to concentrate on the LE element, the new Ocean Blue X links and the (more affordable) smaller links in the collection, namely the single Flower Cloud link in silver and the first Bronze decorative link, My Heart. 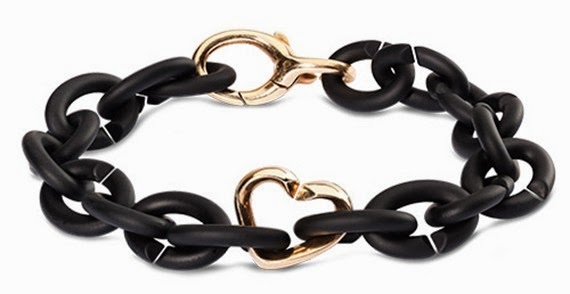 If you fancy the bronze My Heart, don't forget you can buy this in a starter bracelet set, giving you 20 black X links and a bronze lock making a saving on the total cost. If you need more links and/or a lock (don't forget you can use locks as links too) it's a really good deal. I was pleased with my choices and having had to forgo getting one big piece at rather a high cost, having a bag turn up full of new blue X links and the 2 new decorative links felt rather nice and was kinder on my budget. It also meant that there was such a lot to play with out of the bag! I'm so pleased that X by Trollbeads have made a decorative bronze link, it's been what I, and several other X fans have been clamouring for. I know that bronze doesn't oxidise the way silver does, so it limits the designs more, but just look *how* beautiful a metal it is and how sumptuous it looks next to the black rubber X links. I love the new links and wasted no time in putting them into new bracelets, but as much as I experimented with the blue, I found myself being drawn back to the black links. I decided to swap out all the black links for blue in the triple combo to see what it would look like, and for now at least, my opinion is that the ocean blue links are more at home with all silver combos than with the bronze. Same stack but swapping out the black X links for blue. A surprising feature is that the single Flower Cloud is actually flat on the other side... the live pictures I've seen of the statement necklace piece show the same flat finish on the back. I'm a bit disappointed that it's different on the reverse. As far as I know it's the only link produced so far that has a "flat" back - that is when the other side is rounded, obviously there are some flat links in the collection but they're designed to be flat on both sides and they're not links I've been tempted by. Pixels in Love and Skyline are two that spring to mind. I've been wearing this in a stack for 24 hours and find that the Flower Cloud link can and does flip over, so that's something to bear in mind if you're going to get one. I can't see the necklace having the same issues but if I was paying the necklace price I'd want to be able to wear it on either side given that the design is asymmetric. Another delight from Saturday (it was a very delightful day as you can see by the photos) - was that I now possess enough links for an all silver and bronze bracelet. I wasn't a fan of this look originally (I do think the rubber "makes" the bracelet) but I think one of the reasons why I've changed my mind is that some of the silver/bronze combinations I've seen recently look more cohesive than some of the earlier attempts. My new triple stack "stretched out"
On Saturday I had the most fun with the two new single links; but my next challenge is to design some blue & silver bracelets! I've read a lot of comments in forums and groups across the Internet that the New Collection has won some new fans as well as exciting the existing collectors. Clearly I'm a big fan of X and really pleased to see something that I feel is more in keeping with what I felt the brand originally had the potential to promise. But I'm keen to know what you think - do you like the new X by Trollbeads Collection? Hit the comments and let me know! That blue color is so pretty! I can't quite make my mind up about the X collectin in general. Part of me think it looks very cool but I'm not totally convinced. I think X is a good one to go and play with if you have a shop anywhere near to you? It's a wonderfully tactile piece of jewellery and is super light to wear. It also stacks well with other jewellery which is how I often wear it. If you haven't got a shop near you, a couple of rubber link don't cost much to buy (£1.30 per link or $2), so you can play with a few to see if you like it. A UK retailer here, Steffans, did a great promotional campaign when X launched and sent out hundreds of single rubber X's to their customers... it was being able to feel it that made me put in that first order on launch day. Once you start adding decorative links though it's not cheap, although you can wear bracelets without the locks which is what I did when I started with it as that keeps the cost down, but essentially it's as an expensive a bracelet system as any of the other brands once you don't have all rubber!! I love the new necklace pieces and the asian cords, I can't wait to finally get to try those out, but oodles of links and 2 new single links was the way to go for me for now. Some of the links are just miniture sculptures! I thought I'd had is I would love for a series for X links that depicted typical Greek Tableau, although I'd quite like the X-rated versions as well as the non X-rated ones but I think that would be totally awesome!! That bronze heart and blue links are beauties, but I admit that I when you posted yesterday that you had gotten some of the new X, I hoped that you had gotten the skull so that I could see some IRL pictures of it. :D I've seen dealer pictures, but it's never quite the same as seeing another collector' pictures. And I love your all silver/bronze bracelet ;) I'm not sure that I'm completely sold on the blue links, but I agree that I like the look of the silver/blue a bit better than the bronze/blue. Granted, I don't have an opportunity now to see the blue in person so if I did, that might sway me a bit (since I wasn't sold on the X line in general until I saw it in person). You're not the only one who was disappointed by me not having that skull! It's the natural choice along with infinity for me! I actually chose 2 more carved ambers over the bird skull, figuring I can always save up again for it as it will still be there but that the ambers won't - oh to have a money tree! I'm the same with photos, I can wait to see more "real" photos as people start to share them, jewellery can often look very different on as to how it looks "arranged" I don't normally put in so many of my wrist shots but I think it's important to with X.
I'm so glad to hear that X has won some new fans. I love it and really hope it keeps developing as a brand. I'm with you in the making things out of bits of chain when I was younger - I like gothic, grungy styling but with a bit of elegance thrown in now I'm a bit older! I really hope for more bronze decorative links. Loving the bird skull too. It took me ages to finally get the Story curb chain bracelet JUST so I could buy their Ravenskull to go on it. I'd also love the X skull but it's too much to justify right now! Ooh jealous! I really fancy the black Story chain bracelet but I keep moving it down my wishlist and I seem to have gone a long time now without buying it, although I'll admit I didn't find anyone selling it (and having it in stock) for ages... and the Ravenskull, lovely! I think we're all a little in love with the bird skull pendant, that one will be quite a while for me before I can get this, it's not moving off my wishlist though and I can't wait to see what people do with it! I emailed joshua James and they got it in for me but it took ages! I got 3 rose gold links to mix in. Have to say I totally copied Victoria from endangered trolls on that one! I only have the raven skull but the bracelets really light weight and easy to wear. Def recommend it! That's good to know that JJ can get one in, they are one of my LDs! I'm on a bit of a bead hiatus at the moment whilst I gather my budgeting willpower (such that it is i.e. zero) and try and get back on track for the rest of 2014 but I definitely want a black one and the rose gold links sound wonderful!! May have to copy you both!